No earth shattering revelations there 😉 As you read my blog posts its evident I’ve provided numerous examples proving that point. I’m terrible at proof reading; editing never was my strong suit as I read what I meant to say instead of what I actually wrote. Clicking the publish button is often accompanied with concern and regularly followed up with regret. Seriously more than you might imagine. Why? Because I want what I post to be good. More than simply good, I want it to be meaningful. More than meaningful I desire posts that have impact. Even more than impact I want them to be perfect; perfect in engaging the reader, perfect in conveying truth, perfect in the purpose they were meant to fulfill. But Wednesday blogging perfection eludes me and so I often struggle. Case in point, I’ve started writing today’s blog post at least 5 times. Typed words, added sentences, and completed paragraphs only to press back space or “select all” and delete the entire thing. It wasn’t working. which spoke to my heart more deeply than just to my struggle with blogging. In that moment stopped trying to make perfect a blog that wasn’t meant for today and allowed God to make perfect a moment that ministered to the concerns weighing heavily on my heart. I was familiar with these translations of Psalm 138. The New King James Version reads, “The Lord will perfect that which concerns me…” While the striking difference of the translation caught my initial attention, the phrase which remained constant carried a message I cannot ignore. *The Lord will* <– That truth is where comfort is found. ‘Cause I am well aware that *I can’t* … there are so many things on the list of things I can’t..
Where I can’t, the Lord will, according to his will. And today I need to remember, to trust, to rely upon and to rest in that. How about you? 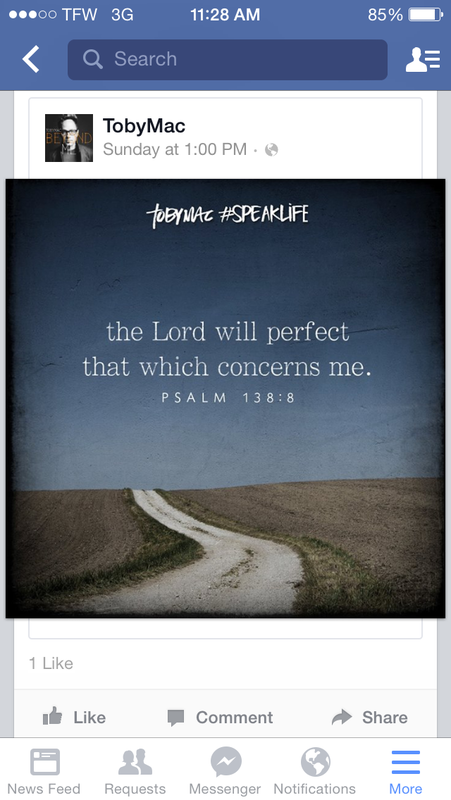 Take time to read Psalm 138 and allow God to speak truth to you and minister to your deep needs.